By Rev. Charles Dahm, O.P. CBS 2 Chicago’s Dana Kozlov, Rev. 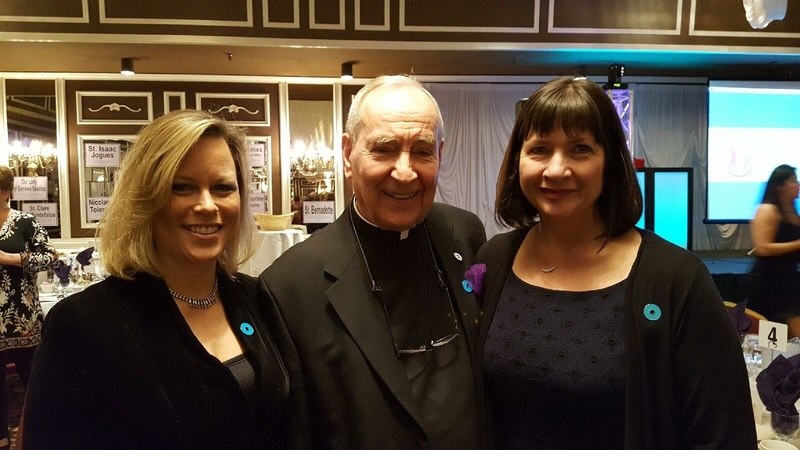 Charles Dahm, O.P., and Chicago Says No More Founder Kristie Paskvan at a celebration last Spring of Rev. 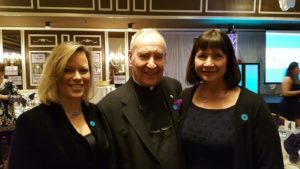 Dahm’s 80th birthday and fundraiser for Archdiocese of Chicago DVO ministries. About 10 years ago, I began preaching about the tragic suffering of women and children who are brutally abused, physically and emotionally, in their own homes. Sadly, the problem continues to grow even as it gains the attention of many volunteer ministers in the parishes throughout the Archdiocese of Chicago. My response to parishioners in families needing help at St. Pius V, where I had served as pastor for 21 years, resulted in my visiting other parishes to talk about the scourge of domestic violence. The Domestic Violence Outreach (DVO) program of the Archdiocese of Chicago is the foundation on which we are building a way for parishes to break the silence surrounding this pervasive problem. As more parishes welcome me to spread awareness and encourage action, partnerships with groups such as Chicago Says No More strengthen those willing to speak out on behalf of victims. Work to help DV victims is urgent. Our dedication and diligence are essential. By now, more than 105 Chicago and suburban parishes in Cook and Lake Counties have scheduled opportunities for me to preach during their weekend Masses. As a result, parish ministry groups have formed in 80 of those parishes. The local parish ministries train volunteers to recognize and understand domestic violence and to respond appropriately. Breaking the silence surrounding the suffering is key to reducing domestic abuse. In addition to raising awareness, DVO connects parish ministries to services for victims as well as directs perpetrators to life-transforming opportunities in their neighborhoods. To break the cycle of abuse in the home, DVO not only helps families in crisis, but also focuses on prevention with youth and young adults. Domestic violence awareness ministries help parish staffs and volunteers introduce prevention curriculum into religious education and marriage preparation programs. The parish ministries also are working with the clergy to combat the pervasive problem of domestic abuse and violence by training seminarians to recognize the signs and speak out against DV. This fall, DVO will conduct a workshop on domestic violence for all seminarians at St. Mary of the Lake University in Mundelein. On September 30, 2017, Cardinal Blase Cupich will officiate and preach on domestic violence at Holy Name Cathedral, 735 North State Street, Chicago, at 5:15 p.m., continuing a tradition started in 2016. Victims of domestic violence and representatives from the growing number of parishes addressing the epidemic of domestic violence will participate. Everyone is welcome to attend. Cardinal Cupich, who has been outspoken on the challenge of violence in Chicago, recognizes much of the cycle of violence often starts in the home. Children who experience violence in their families often imitate abusive behavior themselves, among their friends, at school, and in their future intimate partner relationships. For more information, visit DomesticViolenceOutreach.org where videos, sermons, a manual to help create a parish ministry, prayers, bulletin inserts and other resources are available. Contact me, the DVO director, Rev. Charles W. Dahm, O.P. at cdahm13@gmail.com or 312-371-7752. Rev. Charles Dahm O.P. is a member of the Chicago Says No More Steering Committee and the director of Domestic Violence Outreach for the Archdiocese of Chicago. Hope at St. Pius at St. Pius V parish in Chicago’s Pilsen neighborhood is the largest parish-based DV program in the United States. 735 North State Street, Chicago at 5:15 p.m.